Japanese clothing company Bathing Ape is celebrating its 20th year of existence in 2013, and one way the street wear brand is marking this accomplishment is by tapping 20 artists, including Kanye West and Pharrell Williams, to create their own Bape designs that will be featured on canvasses and t-shirts. The limited edition products will debut at the T-SITE Garden Gallery TSUTAYA located in Daikanyama, Tokyo on April 27th for a three-day run. Bathing Ape is then planning to release the 20th Anniversary designs at their worldwide stores. Bape currently has locations in New York City, London, Hong Kong, Beijing, Taiwan, Paris, Singapore, Seoul, Shanghai, and throughout Japan. The fashion line was started in 1993 by Japanese DJ/Producer Nigo. 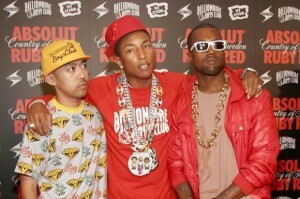 Nigo is also a co-owner of the Billionaire Boys Club line with Pharrell. Pharrell and Bathing Ape have a long history together. The Hip-Hop producer played a big role in introducing the brand to the American market in the mid-2000′s when he and his label signees Clipse began sporting and rapping about Bape.Pharrell and Ye will be joined by other artists like Nigo, Futura, James Lavelle, Show Ayanocozey, Mankey, and Takashi Kumagai.